"Cherkassy" redirects here. For the rural localities in Russia, see Cherkassy, Russia. For other places with the same name, see Cherkasy, Russia. The city is the cultural, educational and industrial center of Cherkasy Oblast and Central Economical Region of Ukraine. Cherkasy has been known since the 13th century and played a great role in the history of Ukraine. Cherkasy was the center of Cossacks, citizens took part in Khmelnychchyna and Koliyivschyna (cossacks' and peasants' rebellions). The city is located on the right bank of Dnieper River (specifically at the Kremenchuk Reservoir), about 200 km (124 mi) south of the nation's capital, Kiev. The city is divided into 2 boroughs (raions): Sosnivskiy (with Orshanets village) and Pridniprovskiy. In June 2011, the city celebrated its 725th anniversary. Cherkasy is situated on the high right bank of the Dnipro River, in the middle of the Kremenchuk Reservoir. Relief of the historical part of the city was influenced by Zamkova (Castle) mountain, where Cherkasy Castle was situated. The major part of Cherkasy occurs as lowlands. View from Hill of Glory on the Rose Valley and water reservoir. The city occupies an area of 69 km2 (26.6 sq mi). The city's length is 17 km (10.56 mi) along the Kremenchuk Reservoir, while its widest point is only 8 km (4.97 mi). From the north-west, Cherkasy is surrounded by forest. Known as Cherkaskiy Bir, it is the biggest (28,500 hectares or 70,400 acres) natural pine forest in Ukraine. The climate of Cherkasy is mild continental, with mild winters and warm (in the last few years mostly hot) summers. The average temperature in the city is +7.7 °C (45.9 °F). Winters are usually cold and snowy (the average January temperature is −5.9 °C (21.4 °F)), but the last few winters have been rather warm with rare severe frosts (up to −25 °C (−13 °F)). Summers are dry and warm (the average temperature in July is +19.8 °C (67.6 °F)), with occasional highs reaching +35 °C (95 °F). The ecological situation in the city is quite stable. The cumulative pollution index as of 2008[update] is 7.56, average with other Ukrainian cities. The main pollutant in the city is "Azot" plant, so the nearby area (south-east part of the city) is the most polluted. The downtown area is heavily polluted as well, due to high traffic volume. The city itself is mostly clean of nuclear pollution from the Chernobyl disaster, although the northernmost part of Cherkasy may have been influenced a little. According to the newest data, the number of inhabitants of Cherkasy is 284,479 as of 1 October 2015. This number is decreasing because of rising mortality rate, socio-economic situation, and the suburbanisation process in the region. The majority of citizens are Ukrainians, with a large population of Russians and Jews. 46.4% are males, 53.6% are females. According to the data provided by the municipal health care department, teens under 14 encompass 15% of the population while pensioners are 19%, which indicates the prevalence of aging citizens as compared to younger citizens. The history of Cherkasy has not been thoroughly explored. The year of establishment is considered[by whom?] to be 1286 on the Kievan Rus territory. There are few facts about the beginning of the city, but it is documented that Cherkasy existed in the 14th century. The first record about Cherkasy dates from 1305 in the Gustynskiy Chronicle, which is the Kievan Rus chronicle. The city is mentioned as an existing city among other Kievan Rus cities, including Kiev, Kaniv, Zhytomyr and Ovruch. The city became one of the centers of the Cossack movement. Citizens took part in the Khmelnychchyna of 1648-1657 and in the Koliyivschyna of 1768-1769. The city was influenced by the cruel social and economical experiments of Soviet authorities and by World War II. In 1954 Cherkasy became the administrative center of Cherkasy Oblast (province), the youngest oblast of Ukraine. In the 1360s, the city entered a new period in its development, by becoming a part of the Grand Duchy of Lithuania. Since then, Cherkasy has become an important defender of its southern borders. In 1384 the city is recognized as a fortified town on the south edge (of Grand Duchy of Lithuania), along with Vinnytsia, Bratslav and Kaniv making defensive line from Crimean Tatars. The city started to be ruled by headman (starosta). During the end of 15th until the beginning of 16th centuries, the post of Cherkasy headman was held by the prominent persons of that time – Bogdan Glinskiy, Kmyta Oleksandrovych, Vasyl Dashkevych, Andriy Nemyrovych, Ostafiy Dashkevych, Vasyl Tyshkevych, Dmytro Baida-Vyshnevetskiy etc. During 15th–16th centuries, Cherkasy was one of the main centers that helped the Cossacks in the population of Ukrainian south. Citizens took part in military marches against Tatars and Turkish, including operations led by Ivan Pidkova. New Cherkasy Castle was the center of city life, it was built in 1549–52 on the place of the old one. After the Union of Lublin in 1569 Cherkasy became a part of Poland. Cherkasy Regiment, which was created in 1625, played a big role in history of the city. During the Khmelnytsky Uprising the regiment became administrative-territorial subdivision (until 1686). During that time Cherkasy's Regiment was one of the most powerful military units and took part in all of the battles for Bohdan Khmelnytsky army. After a successful campaign, Khmelnytsky in 1654 signed an alliance with Muscovy at Pereyaslav. The war ended in 1667 with the Truce of Andrusovo. Cherkasy remained part of Poland, but territories east of the Dnieper River including left-bank Ukraine and Zaporizhia were secured for Muscovy. While in the Polish Kingdom the city was a seat of the county (poviat) which belonged to a greater unit – the Kiev Voivodeship of the Lesser Poland Province until 1793. In 1768 during the Koliyivshchyna turmoils the city was severely damaged and pillaged. In 1791 the city gained Magdeburg rights. It was a royal city of Poland. After the Second Partition of Poland the city was incorporated into the Kievan Guberniya of Imperial Russia. Since the beginning of the 19th century the city was planned by Russian architect, civil engineer and town planner of Scottish descent, William Heste. After the second division of Poland in 1793, Cherkasy became part of the Russian Empire. From 1797 it was a povitove town of Kiev Governorate. In the second half of the 19th century the city experienced a great economical growth. After the railroad appeared in the city, a lot of new industrial enterprises were built. Sugar, tobacco, metalwork, mechanical engineering and trade industries were at peak development at that time. Architect William Heste made a general development plan for the city, which involved building square blocks with straight streets. After the October revolution in 1917 Cherkasy fell under bolshevik control. After that, however, the city changed its rule at least 18 times – during the civil war it was conquered by hetman Pavlo Skoropadskyi, then again by bolshevikis, later by Nikifor Grigoriev. On 1 January 1920, the city finally and for a long period fell under Soviet rule. As with all villages and towns in the area, it was a victim of man-made famine in 1932–1933 (Holodomor) and a Great Purge (a series of campaigns of political repression and persecution in the Soviet Union organised by Joseph Stalin in 1936–1938). The Second World War damaged the city greatly. On 22 June 1941, German bombers attacked Cherkasy. For two months soldiers defended the city, but on 22 August, the invaders took the city. On 14 December 1943, Cherkasy was set free from German invaders. After the end of the war, the city began to recover after being almost destroyed. According to 5-year plans, the city began to re-develop its economy, infrastructure and socio-cultural sphere. In 1954 the city became the administrative center of Cherkasy Oblast (province), the youngest among other oblasts in Ukraine. In the 1960s Cherkasy became the chemical giant of the Ukrainian SSR, after "Azot" (the biggest nitrogen fertilizer producing plant), "Himvolokno" (artificial fiber manufacturing plant), "Himreaktyv" (chemical reagents for military purposes) and many others were built in the city. In 1961 a Kremenchuk hydro power plant was built, forming Kremenchuk Water Reservoir, on which Cherkasy is standing now. This made the city a big transport hub, serving the longest dyke in Ukraine (15 km) with rail and road on it. Since gaining independence, industry in the city has declined, along with the number of citizens and living standards. A lot of big and powerful factories and plants were privatized but couldn't survive in a competitive market. Some enterprises changed their profile – several (3) factories and plants around the city were united under the "Bogdan Corporation" and started production of buses and cars. Some of the companies remained working and became successful, like "Azot". On 28 November 2008, the monument of Lenin was removed from the central square. This caused different reactions in different people. Now the central square, formerly called "Lenin Square", is called "Soborna Square" (Cathedral Square). The square was recently renovated. In 2009, Cherkasy airport received International Airport status (IATA: CKC – ICAO: UKKE). Public transportation is represented by trolleybuses and buses. Trolleybuses started serving the city in 1965, and now are operating on 10 routes, from approximately 6 am till 11 pm. The fleet is old, and mostly consists of ZiU-9 and ZiU-10 vehicles. Recently, 3 new trolleybuses (manufactured by LAZ) appeared in the city. Buses are mostly represented with "Etalon", "Bohdan", and "PAZ" buses. Cherkasy City Bus is the authority that controls the buses in the city, it consists of several private contractors which actually operate the transport system. Cherkasy is a big transport hub due to its location in the center of the country. Two major automobile routes are going through the city - H16 (Uman-Zolotonosha, national route) and P10 (Kaniv-Kremenchuk, regional route). There is a 4-lane highway between Cherkasy and Smila (city which is a part of Cherkasy Urban Agglomeration). The roads are in poor technical condition and road maintenance is poor. The city has a railway station and one railway stop, both are operated by state-owned Ukrzaliznytsia company. Cherkasy has regular connections to neighboring cities with small diesel trains. Major route Odessa-Moscow is passing through Cherkasy. One of the most important railway junctions in Ukraine, is located 23 kilometres (14 miles) from Cherkasy, in the city of Smila, where the Kiev–Dnipro and Odessa–Moscow rail routes cross. As Cherkasy is located on the bank of Kremenchuk reservoir, it has a small riverport. The previously extensive riverboat service along the Dnieper featuring the Raketa hydrofoil ships is no longer existing, limiting river transport to cargo and tour boats and private pleasure craft. There is also a cargo port located in the city. Cherkasy International Airport is located on the western edge of the city. It works for chartered flights around Ukraine, the reason lies behind Boryspil airport in Kiev (which handles most of Ukraine's International flights). In addition, Cherkasy airport is considered as alternative airport for Boryspil in case of unforeseen situations and adverse weather conditions. Cherkasy is an important economic center of Ukraine. The city is presented with different industries, but traditionally the greatest development was reached in chemical industry, automotive industry and food industry. Total yield, generated by Cherkasy industries was near UAH 7,894.3 billion that is 64% of total income of Cherkasy Region. Chemical industry: JSC "AZOT" (chemical fertilizers production), plant "Aurora" (paints and varnishes production), LLC "Cherkasy Autochemical Plant". Light industry: Silk combine "Cherkasy Silk combine", shoe factory "Laventa", sewing factory, named by Lesia Ukrainka, producer of medical and personal care products of cotton-gauze «Vatfarm» Ltd. Mechanical engineering: JSC "CherkasyElevatorMash", 3 plants of "Bogdan" corporation – a car assembling plant ("Hyundai" assembling), a truck assembling plant ("Isuzu" assembling) and a bus construction plant ("Bogdan" assembling), JSC "Temp" (production of food industry equipment), "Photoprylad" (optical parts producing). Food industry: distillery LLC "Buasson-Elit" Belvedere Group, corn-processing and milling plant LLC "Altera Azteka Milling Ukraine", milk-processing plant JSC "Iuria", confectionery "Svit Lasoschiv", meat processing plant "ChPK", mechanized bakery LLC "CherkasyKhlib". Timber and furniture industry: LLC "Marelli", furniture factories "Romira" and "PM-plus". IT business: uCoz, InfoLand, In-Agro, QATestLab, SPD-Ukraine. Internet-providers: McLaut, Megastyle, Volia-cable, Intertelecom, Ukrtelecom. Nowadays there are different types of educational institutions in Cherkasy – pre-school (kindergartens), schools, out-of-school and higher educational institutions. These institutions may be both state-owned and private property. Pre-school education is represented with 50 kindergartens around the city. City-owned schools are 21 general schools, 1 night school, and 14 new-type schools – 2 lyceums, 3 gymnasiums, collegiate, 8 specialized schools. This include First City Gymnasium, City Gymnasium No. 9 and No. 31, Cherkasy Physical and Mathematical Lyceum, Cherkasy Lyceum of Humanities and Law, Specialized School No. 17 (Associated UNESCO school), Cherkasy Collegiate "Beregynia", Specialized Schools No. 3, #13, No. 18, #20, No. 27, #28 and No. 33. Private schools are "Perlyna", school No. 770, and "Sofia". Out-of-school institutions are Center of Youth Art, Young Sailors Club, Center of Tourism and Sports. Several public libraries are serving the city – Central Library of Lesia Ukrainka, City Library for Youth and Children, Central Oblast Library of Taras Shevchenko. Cherkasy is a big cultural center. Several theaters, philharmonic, 3 movie theaters, numerous museums and clubs are serving the city. The city has 3 indoor skating rinks. People can relax in big parks and gardens around the city, they can also visit city's zoo. Cherkasy is among the cities in Ukraine that have their own planetarium. Cherkasy Oblast Local History Museum – the collection of artifacts from the history, nature, culture, and ethnography of Cherkasy Oblast. "Kobzar" Museum of Taras Shevchenko – the only museum in the world about one book. 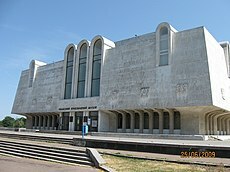 Cherkasy Art Museum – big museum where different exhibitions are held throughout the year. Cherkasy Literary Memorial Museum of Vasyl Symonenko. The city has its own philharmonic, which was created in 1955. The big cultural center is concert hall "Druzhba Narodiv" (Friendship of Nations), where all major concerts are held. Besides, there are numerous local cultural clubs. The city has 4 modern movie theaters - "Salut" (a very old building, was the first cinema in Cherkasy), "Ukraine", "Dnipro Plaza" and "Lubava". Cherkasy is famous as a green city. The main parks are Park Peremohy (Victory Park) with a zoo, Sobornyi Park (Cathedral Park), Juvileyniy Park (Jubilee Park), Park Himikiv (Park of Chemists), Dolyna Troiand (Rose Valley), and 2 chilred's parks. Traditional places of summer recreation are beaches of Dnipro River. The coastline of the city is as long as 15 kilometres (9 miles), and is usually represented with sand beaches. Infrastructure of the beaches is under development right now, although several recreational complexes are already built. On the northern end of the city, in Cherkasy Forest, sanatorium "Ukraine" is situated, along with three-star hotel "Ukraine", and "Kosmos-Bowling" club. There are also several hotels in the city which can accommodate people with different tastes. The city is famous for its sculpture festivals - "Kryzhtal" (held in winter, sculptures are made of ice), "Drevlyandia" (held in summer, sculptures are made of wood, then placed in parks around the city), and "Zhyvyi Kamin" (held in autumn, sculptures are made of stone). Along with the last, "Cherkasy's Singing Nights" are held in the open-air theater in park. Since 2003, Cherkasy hosts international bike festival "Tarasova Gora", which gathers bikers from Ukraine, Russia, and other European countries. This is the biggest festival of this kind held in Ukraine. The City also hosts a music festival (sponsored by Pentax-Richo), that takes the name "Takumar5555", that is the old Pentax brand name, and a play on the city's 55th year of independence. Cherkasy is a big media market, which is served by several local TV stations, newspapers, and numerous radio stations. The city is a home to numerous newspapers, among which are "Antenna", "Molod' Cherkashchyny", "Vechirni Cherkasy", "Akcent", "Nova Doba", "Misto", "Cherkasky Kray" etc. Cherkasy has 5 TV stations – Vikka, Antenna-Plus, Media-Center, Expo-TV, and state-owned Ros'. The city is also covered with nationwide channel broadcasting, like 1+1, Inter, ICTV, STB, TET etc. .
City's radio stations are mostly nationwide networks broadcast on local frequencies, although some local stations exist. FM radio stations include KISS FM, Hit FM, Radio Luks, Radio Rocks, Shanson, Ros', Era FM, Love Radio, 101Dalmatin, Dobre Radio. Sport life of the city is concentrated in several places, among which are the Central Stadium, Water Sport station, Sport Center "Spartak", "Ukraine"; Sport arena "Budivel'nyk"; "Astra", "Central", "Sokil" swimming pools; 2 ice rinks. Also, there are sport-entertainment centers, such as "Selena", "Bochka", and "Sportohota" which can usually be found on the bank of the Dnipro River. Ukrainian Aquabike Cup in 2008 hosted bikers from Cherkasy, Odessa, Kiev, and former Dnipropetrovsk. It was held in "Bochka" entertainment center. Kremenchuk Reservoir Cup – yacht contest among cities located on Kremenchuk Reservoir. Hosted 27 teams from Svitlovodsk, Kremenchuk, Cherkasy, and Komsomolsk. Group 2 Euro/Africa Zone matches of 2008 Davis Cup were held in Cherkasy, in "Selena" sport complex. Cherkasy is home to the basketball club BC Cherkasy (a.k.a. the Cherkasy Monkeys). Cherkasy is home to the volleyball clubs Krug Cherkasy, Zlatogor Zolotonosha Cherkasy (women) and Impexagro Sport Cherkasy (men). They all play in the European tournaments 2008/2009. Cherkasy is represented within Ukrainian Bandy and Rink-bandy Federation. Kreshchatyk Street in Cherkasy circa 1910, with Slovyanskiy Hotel. During its whole history Cherkasy was destroyed and rebuilt numerous times. Only few buildings from the 19th century survived. The system of streets and squares in the old part of the city is one of the few monuments to the city-building art of 19th century Ukraine. Scherbina House (Wedding Palace). It was the most luxurious mansion of prerevolutionary Cherkasy. In Soviet times it was known as the "Palace of Happiness" because it was city's registry office. The house was built by entrepreneur A. Scherbina in 1892. From 1970 to the present day the building is used as the Wedding Palace (civil registry agency). The building of former hotel "Slavyanskiy". It was constructed in the late 19th century by means of an entrepreneur Skoryna in a modernist style with elements of pseudo. In Soviet times it was a hotel "Dnepr". Today the building belongs to "Ukrsotsbank". Tsybulsky House (Museum of Kobzar). This historic building locate in the center of the city was built in the middle of the 19th century. In Soviet times museum of one book – "Kobzar" by Shevchenko – was opened there. Castle Hill (Hill of Glory). The memorial complex with a monument "Motherland" is located at the top of the former Castle Hill. At this point, ancient Russian fort, remains of Cherkasy fortress and Holy Trinity Church were situated. In 1977 all architectural and archaeological sites were completely destroyed during construction of the monument. From the top of the hill you can see beautiful panorama of the Kremenchuk Reservoir. Local History Museum. Cherkasy Oblast museum is housed in a modern building, built in 1985 in the historic center of the city near the Hill of Glory (Castle Hill). Thirty halls of the museum offer sections about nature of the region, archeology, ethnography, history of the region in the 14th – early 20th century, modern history from 1917 to the present. In total there are about 12 thousand exhibits. Puppet Theatre. Cherkasy Regional Academic Puppet Theater is located in the central part of the city, in a building that is an architectural monument of the 19th century. The building is decorated with mosaics with the heroes of fairy tales. School of Music. The building of Cherkasy Music School of S. Gulak-Artemovsky was built in 1903 as a men's gymnasium. The author of the project was great Kiev architect of Polish origin V. Gorodetsky. In the second half of the 20th century, after the construction of a modern extension, the building became the home of a music school. This is a list of cities that have standing links to local communities in other countries. In most cases, the association, especially when formalised by local government, is known as "town twinning" (though other terms, such as "partner towns" or "sister cities" are sometimes used instead), and while most of the places included are towns, the list also comprises villages, cities, districts, counties, etc. with similar links. For example, the State of Iowa have been a sister state with Cherkasy Oblast since 1996. Building of the former Slovyanskyi Hotel, now a bank. Cherkasy Philharmonic. The building is located in downtown, and was recently renovated. (in Ukrainian) The History of Cities and Villages of the Ukrainian SSR – Cherkasy Oblast), Vol.24. Kiev, 1972. ^ "Кинотеатры Черкасс на KINOafisha.ua". Retrieved 12 August 2016. ^ fedir.gontsa.com, Fedir Gontsa -. "Сади та Парки розміщені за алфавітом Ландшафтна архітектура Черкащини". Retrieved 12 August 2016. ^ "Cherkasy city, Ukraine guide". Retrieved 12 August 2016. Wikimedia Commons has media related to Cherkasy. Look up cherkasy in Wiktionary, the free dictionary. This page was last edited on 10 March 2019, at 05:57 (UTC).